WriteBonnieRose is a website authored by Bonnie Rose Hudson. 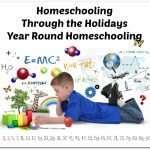 Bonnie is a writer who had never been homeschooled and had no children. 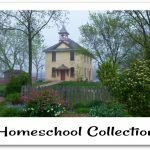 And yet, somehow she found herself thrust into the word of homeschoolers and incredibly passionate about the homeschool market. 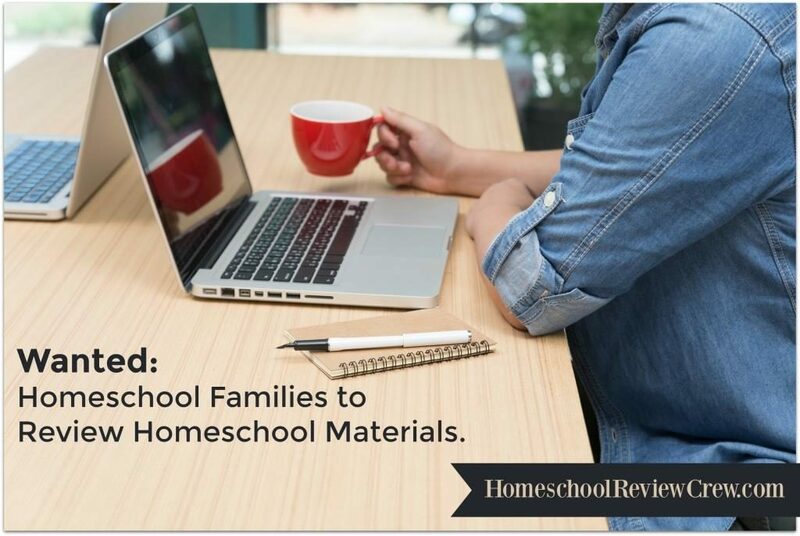 Bonnie does this by providing tons of resources for the homeschool community. 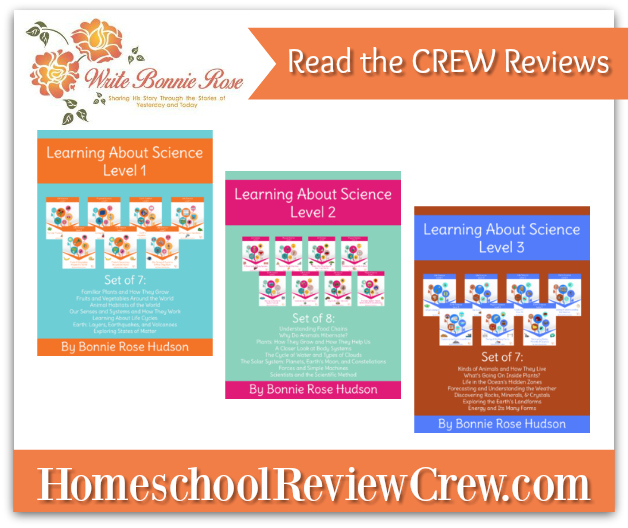 Bonnie’s website is FULL of free resources. 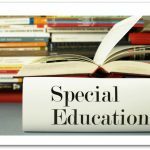 If you are a subscriber, you are entitled to all kinds of fun resources for FREE. Like, seriously . . . completely FREE! In addition, there are many resources you can purchase for incredibly reasonable prices. You can shop her website by subject or by age and the prices for these downloadable products are incredibly reasonable. 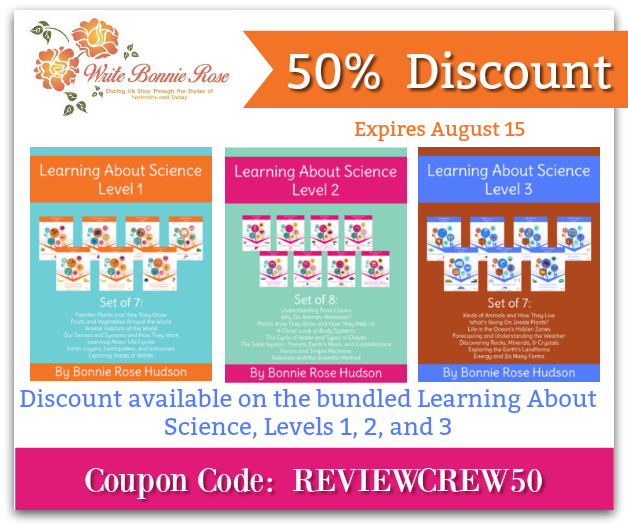 Learning About Science Collection Level 1 is aimed at elementary students and takes them on an exploration of life science, earth science and physical science. 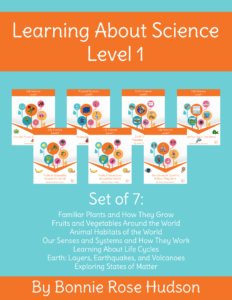 The collection consists of seven books and covers topics such as: how plants grow, common fruits and vegetables, animal habitats, senses and body systems, life cycles, the earth’s layers, earthquakes, volcanoes, states of matter, and more. 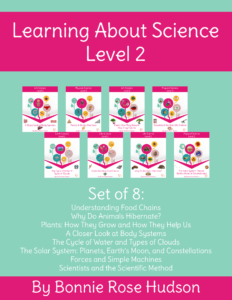 Learning About Science Collection Level 2 is aimed at elementary students and helps them answer questions like what an ecosystem is, how food chains work, why animals hibernate, how plants grow, some of the ways we use plants, major body systems and key organs and tissues, the water cycle, types of clouds, the planets, constellations, forces, simple machines, the scientific method, famous scientists, and more. 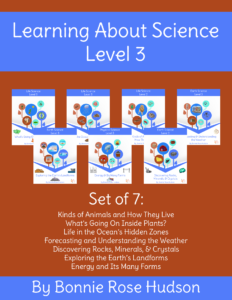 Learning About Science Collection Level 3 print is aimed at elementary students and studies some of the different types of animals, photosynthesis, what’s going on inside plants, the ocean zones and some of its many animals and plants, what makes the weather, tools forecasters use to measure weather, how certain types of weather form, the types of rocks, the uses of specific rocks and crystals, types of landforms, types of energy, and sources of energy. Learning About Science Collection Level 3 Cursive. There are seven books within this collection for elementary students and cover: some of the different types of animals, photosynthesis, what’s going on inside plants, the ocean zones and some of its many animals and plants, what makes the weather, tools forecasters use to measure weather, how certain types of weather form, the types of rocks, the uses of specific rocks and crystals, types of landforms, types of energy, and sources of energy. I encourage you to take some time to click on the links below and check out all that WriteBonnieRose has to offer. I love supporting local businesses, and this is a woman doing just that — providing great resources and helping support her family at the same time. 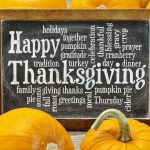 Thank you to Wendi from Wendi Kitsteiner for this anchor post.